The Bus Service Reliability Framework (formerly known as the Quality Incentive Framework) was announced by LTA in January 2014. Described as a carrot-and-stick approach, it aims to improve the en-route reliability of bus services. The trial involves monitoring an initial 22 bus services over a period of 2 years, later expanded to an additional of 23 more bus services and extended till Aug 2016. This compliments the existing Quality of Service (QoS) Standards which applies to all bus services. Under the BSRF, bus operators are provided with monetary incentives to minimise instances of irregular and prolonged waiting times. To resolve such issues, operators are required to enhance their en-route management of bus operations. This involves greater vigilance on the part of Operations Control Centers (OCCs) to make appropriate interventions. To maintain headway, OCCs will take on a greater role in guiding buses along various routes, which includes making more frequent contact with bus drivers, regulating bus travelling speed and reducing long gaps between consecutive buses. On some occasions, buses may have to wait at a bus stop for a minute or two in order to avoid bus bunching further down the route. The trial involved 22 bus services for a period of 2 years. This applied to seven SMRT bus services — 176, 184, 188, 302, 858, 901 and 911 — from Feb 3, 2014 and eight SBST services — 3, 17, 39, 52, 228, 241, 242 and 325 from March 2014. A further seven bus services (SBST Services 51, 154, 292, 354 and SMRT Services 189, 853 and 962) joined the trial from 23 June 2014. Yet another batch of 23 bus services joined the BSRF in 2015; 12 services in June and 11 in December. This included a mix of long and short trunk routes, as well as feeder services, spread across the island. The 23 new services were assessed against a tighter baseline than the original 22 services, taking into account the improvements made in the first year of the trial. SBST Bus Services 58, 63, 76, 130, 163, 175, and SMRT Bus Services 171, 180, 851, 857, 882 & 975. SBST Bus Services 28, 65, 101, 115, 155, 261, 315, and SMRT Bus Services 187, 800, 927 & 965. As announced in Jun 2015, the BSRF trial for all services mentioned above will be extended to Aug 2016. Moreover, all bus services will be under the BSRF from the 2nd half of 2016. LTA also introduced a new indicator, the On-Time Adherence (OTA), which is the percentage of on-time arrivals at selected bus stops. From December 2015, LTA will trial two low-frequency services (SBST Bus Service 115 and SMRT Bus Service 927), under the new indicator. Each 0.1-minute (or six seconds) of deviation in the arrival at each bus stop will be compared to a baseline for the respective route, which categories bus routes on their fleet size. Operators face anywhere between a monthly incentive amount of $6,000 or a penalty of $4,000 per 0.1 minute of outperformance or underperformance respectively. LTA will bring all bus services under the BSRF from the second half of 2016 with the transition to bus contracting. LTA will therefore be extending the trial from February 2016 to end-August 2016 such that there is no gap in implementing the framework. All bus services will be assessed under the BSRF from the 2nd half of 2016 with the transition to the Government Contracting Model (GCM). Under BSRF, bus operators will be rewarded or penalised based on how regular the bus arrival intervals are at bus stops measured by an indicator known as Excess Wait Time (EWT). The EWT score is a reflection of the overall performance of a bus service and is measured at a number of selected bus stops en-route. EWT, which is a measure of commuters’ waiting time, compares how the actual waiting time (AWT) of commuters deviates from the scheduled waiting time (SWT). Essentially, EWT is calculated with using the AWT subtracted from the SWT. A perfect EWT score of 0 minute means that the bus service arrived on time according to schedule for every bus trip during the entire period the service runs. However, in reality, an EWT score of 0 minute is impossible to attain given the nature of bus operations, which is dependent on traffic conditions on the road. Hence, an EWT score of 1 minute is considered good while an EWT score of 2 minutes is considered satisfactory. The lower the EWT score, the better the bus service’s reliability. Longer bus routes tend to have poorer regularity and reliability (due to the compounding effects of traffic conditions) and hence higher EWT scores. 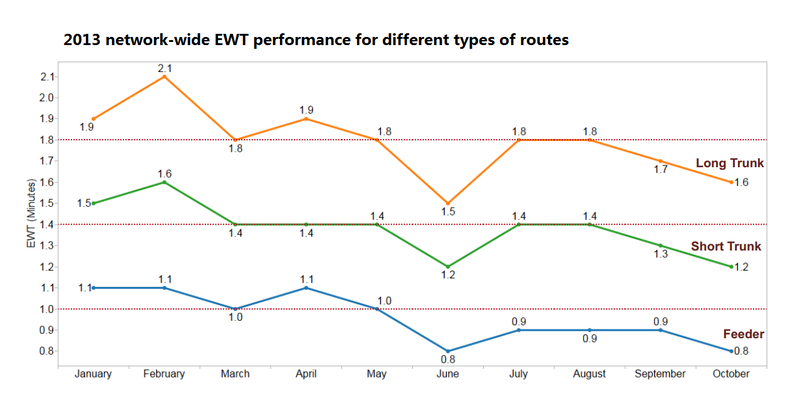 Each bus service has its own existing “baseline” EWT depending on the current performance and the characteristics of the route. Typically, a long trunk route will have a higher existing “baseline” EWT. The EWT of a particular bus service can be improved if bus arrivals at each bus stop become more regular and more evenly spaced. A lower EWT means fewer instances of bus bunching and as a result, commuters should generally experience more regular waiting times and greater ease in boarding as the passenger load will be spread more evenly across the various bus trips. EWT will be measured during both peak and off-peak hours from Mondays to Fridays, excluding Public Holidays. This will include satellite-based global positioning system data that track public buses, the ticketing system, as well as on-site audits. For bus services with lower frequencies, where headways are generally more than 15 minutes, adherence to arrival timetables is more pertinent. A new indicator, the On-Time Adherence (OTA), indicates is the percentage of on-time arrivals at selected bus stops in comparison with the operator’s published schedule. Under the OTA indicator, a bus arriving at a bus stop is considered on time if it is no more than two minutes early and no more than five minutes late. Buses are required to be on time for at least 85% of arrivals daily. To qualify for incentives, bus services must have more than 87% of trips arriving on time. Conversely, bus services are penalised for less than 83% of trips arriving on time. 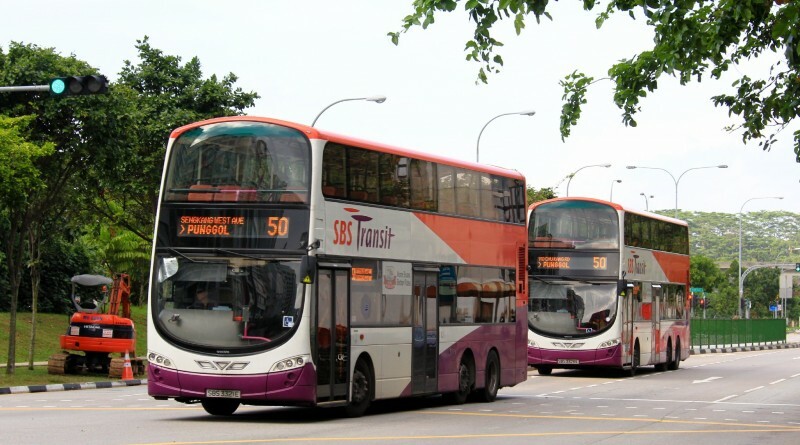 The introduction of the OTA as part of the BSRF trial allows LTA to trial and make refinements to the indicator, before introducing it more widely to other low-frequency services as part of the bus contracts. Bus Services 115 & 927 were assessed using OTA as an indicator for the BSRF trial. Under the BSRF, bus operators are given monetary incentives to reduce their EWTs. Reducing EWTs is operationally challenging and additional resources will be required, such as boosting the number of staff at OCCs to manage bus services and having standby buses to be deployed mid-route if there are delays to buses which are already en-route. Incentives are calibrated in accordance with the efforts and operational costs involved in improving the reliability of the services. Operators are rewarded only when they achieve improvements in bus service regularity and are penalised if the service is not so. Similar incentive-penalty schemes have been practised in other cities. The BSRF system, including the relative quanta of incentives and penalties, was modelled after London which has successfully implemented a similar programme for over 12 years. To allow bus operators to adjust to the new framework, a transition period from 3 February until 31 May 2014 monitors EWTs without offering any incentives or penalties. OCCs can regulate bus speeds by having the bus slow down or hold at bus stops for short intervals, generally no more than about a minute or so and only if it does not cause any obstruction. All buses are already required to adhere to speed limits on the roads, as well as being installed with speed limiters that prevent them from going beyond 60km/h. The BSRF trial allows LTA to better understand bus reliability improvements that can be made on different types of routes, as well as the BSRF’s effectiveness to get bus operators to improve service reliability, complemented by other regulatory measures such as more strictly enforcing bus lanes and enhancing bus priority schemes and measures. The bus services selected for the trial provide a balance of high-frequency feeder and trunk routes with some reliability issues. Incentive amounts are calibrated in accordance with the effort and therefore operational costs involved in improving the EWT performance of a bus service. For example, as it is operationally more challenging to manage and regulate the bus arrival intervals of a larger bus fleet, higher incentives are allocated to services with larger fleet sizes. This also translates to higher penalties for the underperformance of services with larger fleet sizes. As the implementation of the BSRF carries a significant change to bus operations, there was no incentives nor penalties until the end of May 2014, to give PTOs time to make adjustments. Incentives and penalties will be assessed and paid out to the bus operators on a 6-monthly basis, after the phase-in period. Under the OTA indicator, a bus arriving at a bus stop is considered on time if it is no more than two minutes early and no more than five minutes late. Buses are required to be on time for at least 85% of arrivals daily. To qualify for incentives, bus services must have more than 87% of trips arriving on time. Conversely, bus services are penalised for less than 83% of trips arriving on time. Incentive and penalty amounts have yet to been announced. Safety concerns were raised after the announcement of the BSRF, notably as to whether the penalty framework would lead to unsafe driving since bus drivers may be pressured to keep to their schedule. Transport Minister Lui Tuck Yew assured that the BSRF is unlikely to encourage unsafe driving behaviour from bus drivers as the BSRF works by having buses slow down to even out arrival times, instead of speeding up. In addition, safety will be ensured with speed limiters on buses restricted to 60kmh, and disciplinary actions will be taken against drivers who are found driving recklessly. Operators are still required to comply with QoS Standards on accident rates. Jun 2014 BSRF results. Image adapted from LTA FB. Initial results for the BSRF were released on 16th Jun 2014. For SMRT Buses, all 4 trunk services (Services 176, 184, 188 & 858) have seen improvements in their Excess Wait Time (EWT) compared to 2013. 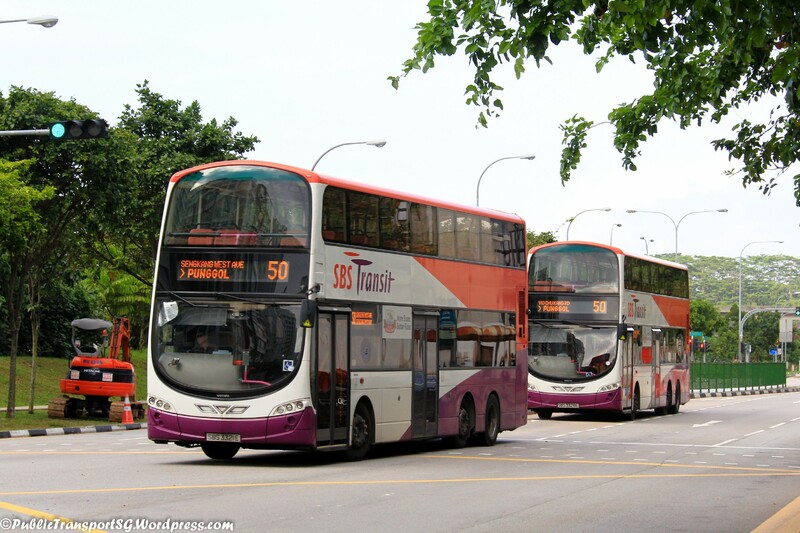 Results for its feeder bus services (Services 901, 911 & 302) have been mixed. Exact scores are reflected in the table on the right. 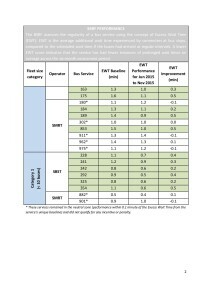 The 8 SBS Transit bus services which were included in the BSRF trial in March & April have also shown improvements across the board in their EWT scores. This means that the actual waiting times of the bus services are now closer to their scheduled waiting times, with lesser instances of bus bunching. The BSRF results from June 2014 to November 2014 were released on 9 April 2015. 20 out of the 22 BSRF services has shown improvement on service reliability in which 18 services has earned the respective operators the incentive. The 20 services are: SBST Services 3, 17, 39, 51, 52, 154, 228, 241, 242, 292, 325, 354, and SMRT services 176, 184, 188, 189, 853, 858, 901 and 962. The remaining 4 services had performances in the neutral zone and neither earned any incentive nor incurred any penalty. The 4 services are: SBST Service 39 and SMRT Services 302, 911 & 962. These improvements mean that commuters on average have experienced more regular wait times and greater ease in boarding as the passenger load is spread more evenly across the various bus trips. Based on its performance, SBS Transit earned $710,285.71 for reliability improvements to 11 services and SMRT earned $345,714.29 for improvements to seven services. There were no penalties deducted from both operators for this assessment period as none of their services had deteriorated more than 0.1 minutes to fall into the penalty zone. The incentives will help to offset the costs incurred by the PTOs to hire the additional service controllers to support the BSRF. The BSRF results from December 2014 to May 2015 were released on 9 Oct 2015. 17 out of the 22 BSRF services has shown improvement on service reliability in which all 17 improved services has earned the respective operators the incentive. The 17 services are: SBST Services 3, 17, 39, 51, 52, 154, 228, 241, 242, 292, 325, 354, and SMRT services 184, 188, 189, 853 and 858. The remaining 5 services had performances in the neutral zone and neither earned any incentive nor incurred any penalty. The 5 services are SMRT Services 176, 302, 901, 911 & 962. In comparison to the previous BSRF results based on June – Nov 2014 above, SBS Transit Services 39, 52, 241 and 292 as well as SMRT Bus Services 189, 858 and 911 has further improved while SMRT Bus Services 176, 184, 302, 853, 901, and 962 have worsened. Based on its performance, SBS Transit earned $816,000 for reliability improvements to 12 services and SMRT earned $384,000 for improvements to 5 services. There were no penalties deducted from both operators for this assessment period as none of their services had deteriorated more than 0.1 minutes to fall into the penalty zone. The incentives will help to offset the costs incurred by the PTOs to hire the additional service controllers to support the BSRF. The BSRF results from May 2015 to November 2015 were released on 9 May 2016. 27 out of the 34 assessed BSRF services has shown improvement on service reliability (ie. 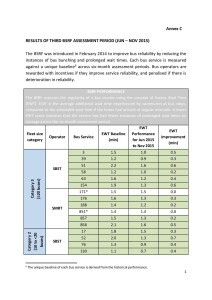 EWTs that were better than the set baseline) in which 25 improved services has earned the respective operators the incentive. The 25 services are: SBST Bus Services 3, 17, 39, 51, 52, 58, 63, 76, 130, 154, 163, 175, 228, 241, 242, 292, 325 and 354, and SMRT Bus Services 176, 184, 188, 189, 853, 857 and 858. 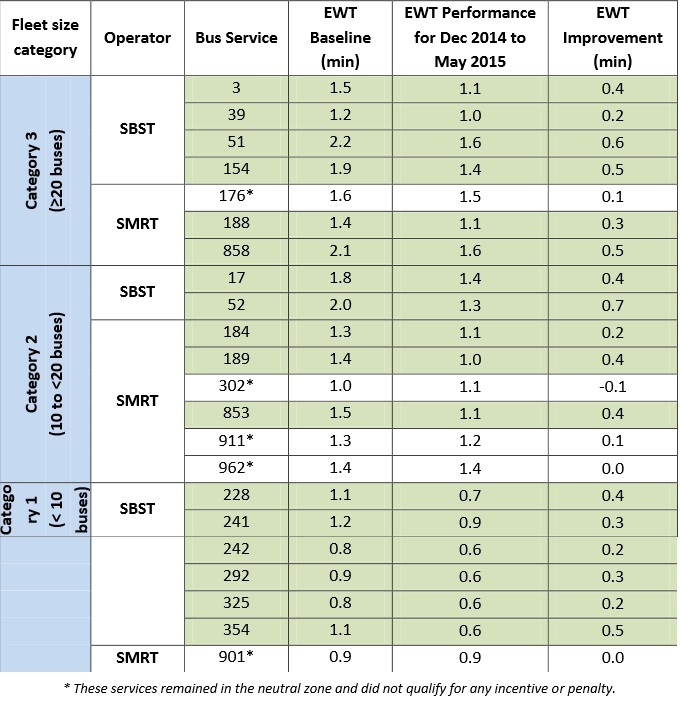 In comparison to the previous BSRF results based on Dec 2014 – May 2015 above, SBS Transit Services 3, 39, 154 and 292 as well as SMRT Bus Services 176, 189, 853 and 962 has further improved, while SBST Bus Service 17 and SMRT Bus Services 188, 901 and 911 have worsened. Based on its performance, SBS Transit earned $1.34 million for reliability improvements to 18 services and SMRT earned $504,000 for improvements to 7 services. There were no penalties deducted from both operators for this assessment period as none of their services had deteriorated more than 0.1 minutes to fall into the penalty zone. The incentives will help to offset the costs incurred by the PTOs to hire the additional service controllers to support the BSRF. Based on a news report published on 1 Mar 2017, bus firms SBS Transit and SMRT have earned a combined $3.4 million in incentives under the BSRF. SBS Transit earned $2,040,000 for improvements to 25 service, while SMRT Buses earned $1,403,300 for improvements to 20 services. The exact breakdown of results have yet to be published.